Push productivity to the edge\nThe worldâ€™s first 25" monitor with InfinityEdge and Dell HDR. 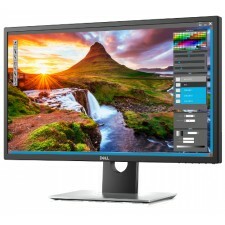 Featuring stunning colors and spectacular clarity on a QHD display.\n\nSee the whole picture\nWith your UltraSharp monitor you get more than a pretty pictureâ€”itâ€™s a gorgeous screen made for multitasking.\n\nLifelike visuals\nA captivating sight: Dell HDR combines greater depth of colors, remarkable clarity and a high contrast range of shades to create strikingly realistic images.\n\nColor consistency comes standard: Your UltraSharp monitor is factory calibrated at 99% sRGB coverage to an accuracy of Delta-E less than 2, for precise hues right out of the box. Each monitor features a factory calibration report that guarantees color correctness, so you can trust your projects reflect true color intensity.\n\nUncompromised images: View your HDR10 content like it was meant to be seen. Even your HDR photos will boast a lifelike experience.\n\nGet it all done\nStaying on task doesnâ€™t mean sacrificing comfort. Discover the best of both worlds with this TUV-Certified4 monitor thatâ€™s as efficient as it is effortless to use.